Having launched in Australia in December last year, Amazon has now reached 10,000 sellers on the marketplace. In two months the marketplace has doubled in size from 5,000 sellers in January. While initially requiring approval to sell on the marketplace, Amazon has recently made the process as simple as it is in other countries, and thus the marketplace growth accelerated considerably. Though, this has increased the share of sellers shipping from China to more than a half. This year more sellers joined in Australia than in Mexico, while Mexico is a more established and over five times larger marketplace. 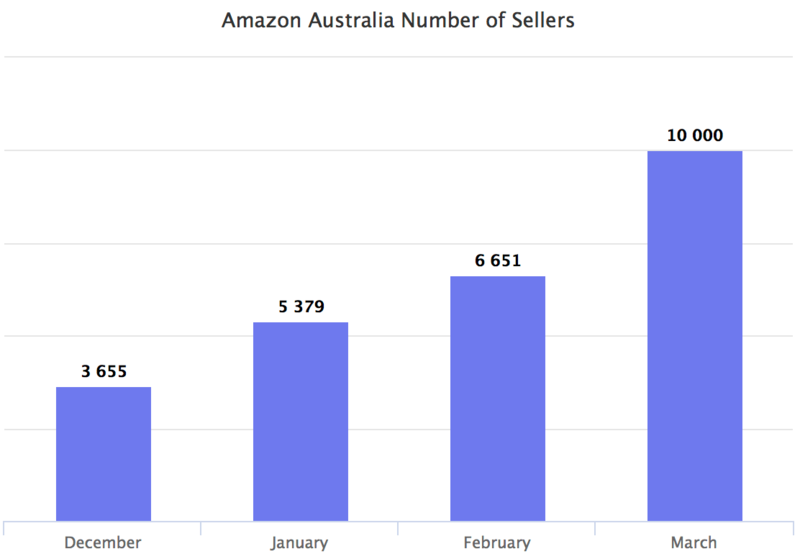 70 new sellers join in Australia every day, making Amazon.com.au the fastest growing marketplace relative to its size. Amazon Australia is expected to exceed 50,000 sellers by the end of the year. At the end of February the company launched Fulfillment by Amazon (FBA) in Australia, however without Prime memberships yet. Instead all orders of $49 or more qualify for free delivery within Australia, as long as it is fulfilled by Amazon for a seller, or is sold by Amazon. More than a thousand sellers are already storing some of their inventory at Amazon’s warehouses, less than a month after FBA launched. Half of those have the majority of their products stored in FBA. FBA, and Prime memberships expected to launch later in the year, are key for the future. When Amazon launched in Australia many shoppers were not getting their products on time, or at all. As a result 12% of seller reviews on the marketplace were negative, higher than on any other marketplace. It has now decreased to 6%, in line with Amazon’s other marketplaces. Amazon launched in Australia without much fanfare, despite the heightened expectations from the press. Many have expected the groundbreaking impact to retail Amazon has in other countries. But Amazon didn’t get there on day one, so it will only to start to impact Australia once Prime has launched, and the marketplace has built up critical mass. “It doesn’t damage the Amazon brand but people are disappointed. It’s not that they won’t forgive the brand, they’re just waiting to see what happens. When Amazon first launched people thought it would radically change things, but it hasn’t yet. But that’s not to say that it won’t. Amazon can easily win back the hearts of Australian consumers because they have been deprived of a good online experience. Traditional retailers are still struggling to transform in the digital age and that’s apparent in the Australian market.